What the world really needs right now is a presidential candidacy from Michele Bachmann, who has been making major moves in that direction. You may recall Bachmann as presidential material from this crazy-eyes "response" to the State Of The Union. Bachmann also shares with Palin the dubious distinction of making Bill O'Reilly seem reasonable. He said last night that she may "speak to the wheelhouse of the Republican party" but her "frame of reference is questionable at this point." The equal or greater disdain of Republican Party leaders, who have mostly ignored her leadership bids, hasn't stopped Bachmann. She's said she will declare by the summer, and has already started putting together an operation in Iowa. Her first hire is suitably rooted in paranoia and bigotry: Iowa state Senator Kent Sorenson, whose legislative feats include a birther bill. 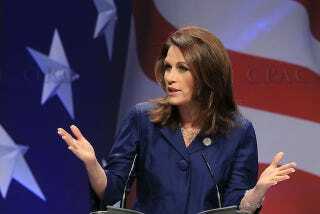 The New York Times points out that Bachmann repeatedly said the words "I'm in!" But she didn't really mean it, she said in a later interview. "I'm in to make sure that Barack Obama is a one-term president. I am in, in terms of 2012, to make sure that we do have a rock-solid conservative." We're in too. In to call her out on her distortions, conspiracy theories, thinly-veiled gender-baiting, and less-veiled race-baiting.